Uftring Chrysler Dodge Jeep Ram in North Pekin, Illinois is proud to announce that we are Central Illinois' #1 Jeep Dealership for 2012 (year to date), according to Chrysler Corp. divisional data. After taking over the North Pekin, Illinois Jeep franchise in 2010, Steve Porter and the Uftring Pekin Jeep team have quickly established themselves as the area's foremost Jeep experts. Uftring Pekin is dedicated to offering our customers an amazing price, sensational selection, tremendous quality, awe-inspiring lifts, quality repair and unbridled enthusiasm for the Jeep product and our customers. Uftring Pekin serves Jeep customers in Peoria, Pekin, Washington, East Peoria, Morton, Metamora and beyond and is growing every day. If you want to purchase a Jeep Wrangler, Grand Cherokee, Compass, Liberty or even transform your Jeep into something truly extraordinary, see the Jeep Team at Uftring in Pekin. We're right off I 474 on Route 29 in North Pekin. 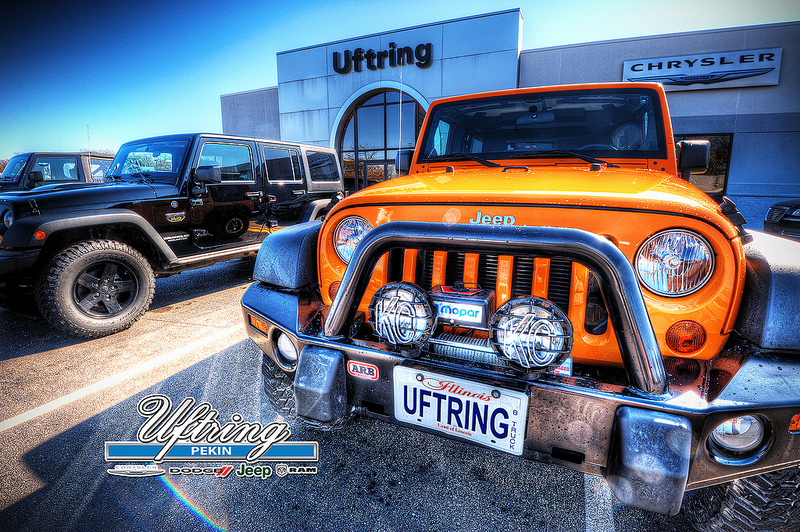 Visit our Peoria IL area Jeep dealership online at UftringPekin.com.